Like other browsers, Firefox also stores the login details such as username, password for every website visited by the user at the user consent. All these secret details are stored in Firefox sign-on database securely in an encrypted format. FirePassword can instantly decrypt and recover these secrets even if they are protected with Master Password. Also FirePassword can be used to recover sign-on passwords from different profile (for other users on the same system) as well as from the different operating system (such as Linux, Mac etc). This greatly helps forensic investigators who can copy the Firefox profile data from the target system to different machine and recover the passwords offline without affecting the target environment. This mega release supports password recovery from new password file 'logins.json' starting with Firefox version 32.x. Note: FirePassword is not hacking or cracking tool as it can only help you to recover your own lost website passwords that are previously stored in Firefox browser. It works on wider range of platforms starting from Windows XP to Windows 8. Instantly decrypt and recover stored encrypted passwords from 'Firefox Sign-on Secret Store' for all versions of Firefox. 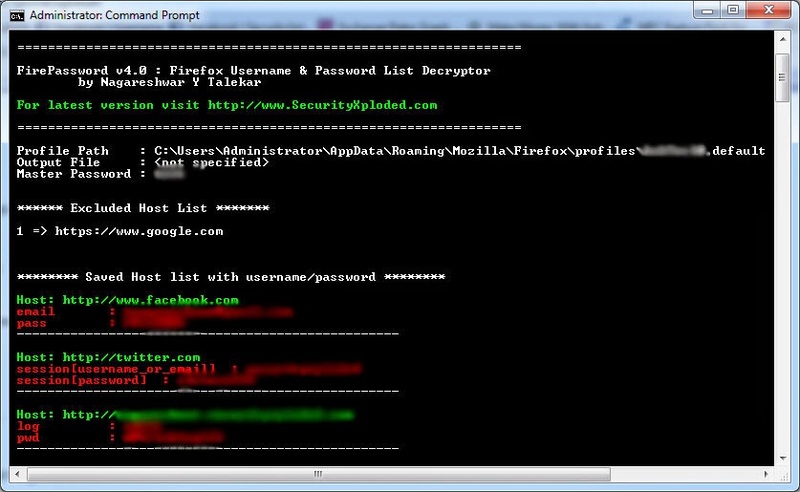 Recover Passwords from Mozilla based SeaMonkey browser also. Fully Portable version, can be run from anywhere.